Isco 6712 Portable Full-Size Sampler - Gripp Inc.
Isco’s 6700 Series Portable Samplers have set the industry standard, providing the most comprehensive and durable performance available. With the introduction of our new 6712, Isco takes another step toward the ultimate by including SDI-12 interface capabilities. This full-size portable lets you take full advantage of the advanced 6712 Controller, with its powerful pump, versatile programming, and optional plug-in modules for integrated flow measurement. Setup is fast and simple, with online help just a key stroke away. In the Standard Programming Mode, the controller walks you through the sampling sequence step-by-step, allowing you to choose all parameters specific to your application. Selecting the Extended Programming Mode lets you enter more complex programs. Optional land-line and GSM and CDMA cellular telephone modems allow programming changes and data collection to be performed remotely, from a touch-tone phone. They also provide dial-out alarm. With eleven bottle choices, Isco’s 6712 Sampler lets you quickly adapt for simple or intricate sampling routines. Up to 30 pounds (13.5 kg) of ice fits in the insulated base, preserving samples for extended periods, even in extreme conditions. The 6712 with the “Jumbo Base” option holds bottles up to 5.5 gallon (21 liter). The 6712 Portable Sampler features a vacuumformed ABS plastic shell to withstand exposure and abuse. Its tapered design and trim 20-inch (50.8 cm) diameter result in easy manhole installation and removal. Large, comfortable handles make transporting safe and convenient—even when wearing gloves. 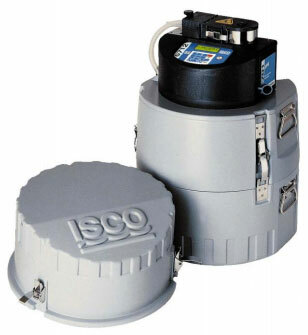 Isco’s 6712 Portable Sampler carries a NEMA 4X, 6 (IP67) enclosure rating. Superior capability, rugged construction, and unmatched reliability make the 6712 the ideal choice for portable sampling in just about any application. For more information, download the Isco 6712 Portable Full-Size Sampler Datasheet PDF.